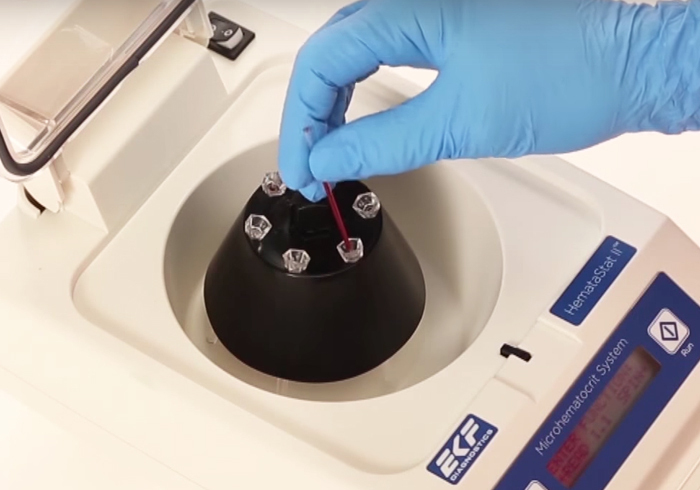 HemataStat II™ is a hematocrit centrifuge delivering quantitative readings for up to six blood samples from a single 60 second spin. 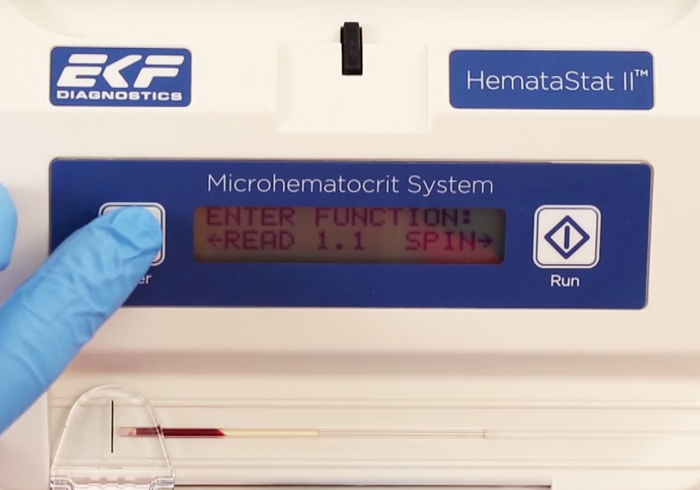 EKF Diagnostics’ HemataStat II™ is a micro hematocrit centrifuge that provides a quantitative hematocrit reading for up to six blood samples from one 60 second spin. HemataStat II™ is an ideal hematocrit centrifuge for point-of care and laboratory use in clinics and hospitals. Its compact size and the optional battery pack make it well suited for outreach programs and also for veterinary settings. 2. Place the sealed tube into the centrifuge and spin for 60 sec. 3. Results are displayed on screen. The multi-lingual display provides easy to follow instructions to ensure accurate results every time. The HemataStat II™ Hematocrit Centrifuge combines easy maintenance with a high degree of user safety, for example, heparinized ClearCrit™ tubes are used to collect the blood sample and are available in plastic, glass or Mylar® coated glass, designed for maximum user safety. Centrifuge, power supply, 10 disposable transparent tube holders, user guide and quick reference guide. The HemataStat II™ Hematocrit Centrifuge is accurate +/- 1% if the hematocrit is displayed in whole numbers, +/- 0.5% if the hematocrit is displayed with the decimal. When compared to the NCCLS method, the correlation coefficient is 0.9978. Can samples from an EDTA tube be used? Yes. Ensure that the sample is well mixed first. Is the result affected by air bubbles? No. The HemataStat II™ Hematocrit Centrifuge results are not affected by air bubbles in the sample. What size I.D. (inside diameter) capillary tubes should I use? Most facilities use 1.1mm I.D. tubes. 0.5mm I.D. are generally used for pediatrics because of the smaller sample required. How many spins can be completed on a single battery charge? A fully charged nickel metal hydride battery pack should provide greater than 75 spin cycles assuming that the time to read the tube is less than one minute and that the centrifuge is turned off when not in use.